The bad news: Stocks slumped Thursday after poor economic news from Europe. The good news: It could have been a lot worse. 1. By the numbers: The Dow Jones Industrial Average's 71-point slide doesn't look all that awful considering it was down as much as 180 points earlier in the day. 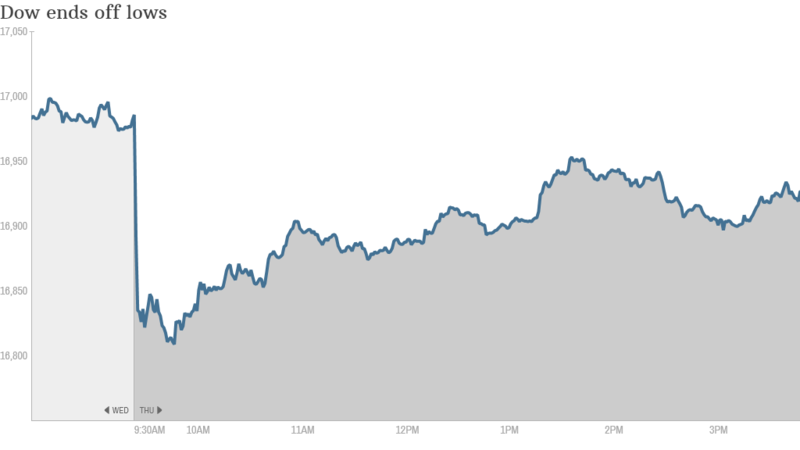 The S&P 500 and Nasdaq had been down about 1%, but closed off 0.4% and 0.5%, respectively. Investors seemed to conclude that the European troubles are just a blip, not necessarily indicative of a longer-lasting slump. 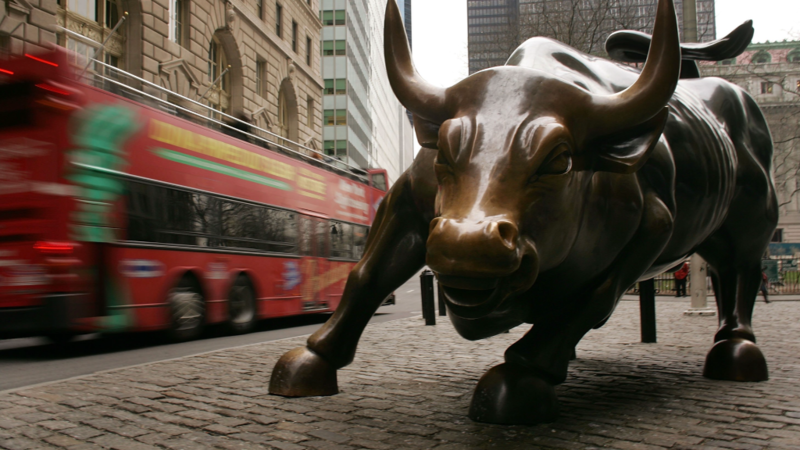 Despite the comeback, the major markets are on track for a steep weekly decline. That's especially true for the Nasdaq, which has tumbled around 2% this week. 2. Blame Europe! The ugly day began in Europe, where a little known Portuguese bank brought back concerns about the health of the continent's financial system. Trading of Espirito Santo Financial Group -- the leading shareholder in Portugal's biggest bank -- was suspended. Shares of Banco Espirito Sant (BKESF)plummeted 17% before they were also halted. The euro banking woes trickled down to U.S. financial firms, with shares of Bank of America (BAC), Morgan Stanley (MS) and JPMorgan Chase (JPM) all down about 1%. But that's not all that caused European markets to tumble. New reports show industrial production fell sharply in France and Italy, signaling the European economic recovery could be in trouble. 3. Earnings season is here: After Alcoa (AA) kicked off earnings season earlier this week with a home run, a number of retailers reported mixed results on Thursday. Family Dollar (FDO) escaped early losses and closed just slightly lower despite reporting a decline in same-store sales and profits. Maybe investors approve of the struggling retailer's new plan to lure in shoppers: booze. The company said it will follow Wal-Mart (WMT)by selling beer and wine in the coming years. Related: Is there a 'retail funk'? Shares of Tractor Supply Co. (TSCO) slumped 2% after the company posted disappointing earnings on Wednesday. 4. Stock movers: Lumber, Potbelly, T. Rowe Price: Investors took a big axe to shares of Lumber Liquidators (LL). The flooring retailer plummeted almost 22% after disclosing a traffic tumble and projecting profits that would badly miss expectations. The somber news sparked selling in home improvement stocks like Ethan Allen Interiors (ETH), Lowe's (LOW) and Home Depot (HD). Potbelly, (PBPB) which went public in October, plunged 25% after the sandwich chain cut its outlook for the year and said it will try new marketing moves. "$PBPB Calling a restaurant 'potbelly' in a nation where everyone is trying to lose weight might be a clue?" StockTwits user BlackBerril wrote. T. Rowe Price (TROW)fell 3% and was among the worst financial performers after the asset manager was reportedly downgraded by Evercore. The worry is that T. Rowe could be hurt by in the coming months by investors yanking cash from U.S. equity funds. 5. Return of U.S. jobs: Americans received another glimmer of hope about the jobs market on Thursday. The Labor Department said initial claims for jobless benefits fell by 11,000 last week to 304,000. That was slightly better than many on Wall Street expected. The weekly claims report comes on the heels of the June jobs report, which revealed the U.S. added an impressive 288,000 jobs.